That will be a great addition to this block! Love the pedestrian activation on the sidewalk. Good stuff. Anticipated start of construction is Q3 2019. Sweet. Not sure what is taking them so long to get started, but glad it’s happening! Definitely a nice connection for Glenwood South to Bloc 83 and beyond. Do you know if demo is happening before Q3, or starting then? @dtraleigh are these slightly different than what you posted on Feb 5th on your site? I personally like the look of what you previously posted better. But either way… I’m really excited about this much needed hotel. I like the color and materials used. Also do they still plan to have the top 2 floors as condos for sale? It’s the most up-to-date so I assume things have changed. No news on any change to the upper floor condos but things change all the time so we’ll see. The drawings that were put out for pricing are marked as 60% Marriott Submittal so probably more tweaks to come. Looking forward to the next round of renders. 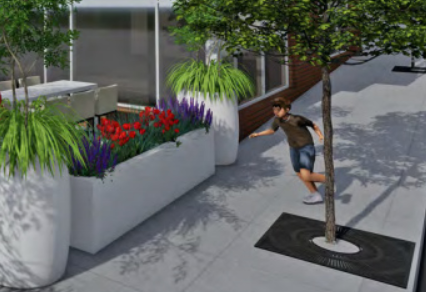 Maybe they’ll have more stunts for us to find, like this kid about to Parkour off the flower base. The Willard Hotel should have building permits this summer . Great to see this get started in a few months. Check out the guy doing the push ups on the side walk in the original images. I’ll just stop here on this sidewalk and do 20.